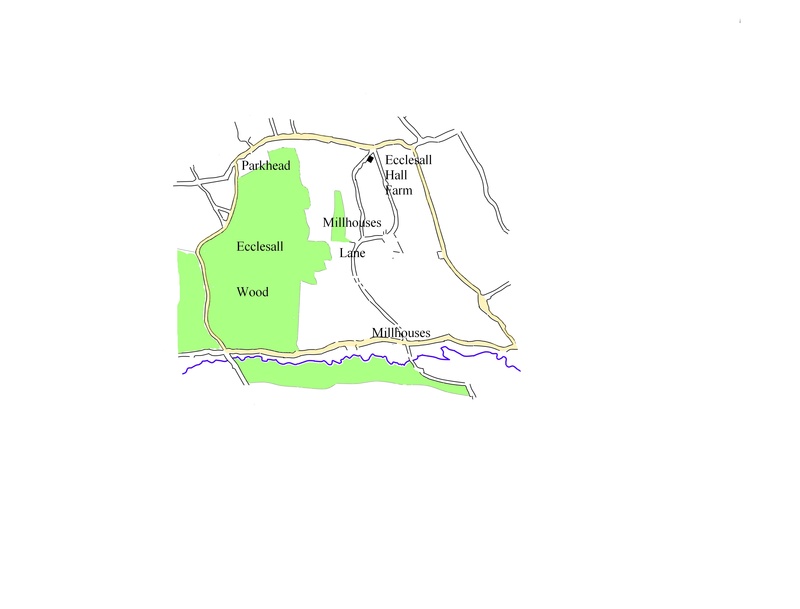 Ecclesall Hall Farm is believed by some authorities to have been the last remnants of Ecclesall Hall – home to the de Ecclesall family; although greatly reduced in size and converted into a farm, after losing its status, because the Lords of the manor no longer lived there. It stood near the top of Millhouses Lane at the right-hand side, on what would now be the corner of Woodholm Road. The earliest visual evidence we have of it is the clip, top left, from a map of 1807. Perhaps, though, this was always just the farm of a nearby Ecclesall Hall, which has left us no visual traces? Some two hundred years ago Joseph Hunter wrote [i]There is, or at least lately was, within the Manor of Ecclesall, an ordinary dwelling house, which was dignified by the title of Ecclesall Hall. It stood near the old chapel and was probably on the site of the original seat of the Ecclesalls’ lords of Ecclesall. The way Hunter phrases this statement implies that he, or others of his acquaintance, had actually seen it, but it no longer existed at the start of the nineteenth century, so you can take your pick.